Dr. Kateregga is highly respected as an expert in depreciation, valuation, the economics of capital investment decisions and technological forecasting. 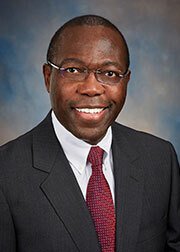 Dr. Kateregga joined the firm in 1986 and is based in the firm’s Florida office. He has participated in conducting numerous studies for both public and privately-owned utilities and has contributed extensively to the development of statistical models, life analysis and depreciation software used by Foster Associates and clients of the firm. Asset Tracking System developed by Foster Associates, Inc., 16th Annual Meeting of Society of Depreciation Professionals, September 2002. A Combined Index in Simulated Plant Record Analysis,Journal of the Society of Depreciation Professionals, Volume 8, No. 1 (1998). Per-Unit Net Salvage Estimation,The Engineering Economist, Summer 1996, Volume 41, No. 4. Technological Forecasting Models—Applications in Capital Recovery, Third Annual Meeting of Society of Depreciation Professionals, December 1989. Technological Forecasting Models and Their Applications in Capital Recovery, Iowa State University Regulatory Conference, May, 1986. Capital Recovery Factors for Equipment with Weibull Lives, Maintenance Management International, 4 (1983).